Banana is undoubtedly one of the most popular fruits in the world. Who doesn't like a banana in any way? You can eat it with fresh fruit, mashed, smoothies, ice cream, dry fruit, some dessert (like fruit salad, banana split) and more. Sure everyone will find the way he likes a banana. Most Americans love bananas and have declared August 27 as a banana-lovers holiday. Banana is a very healthy fruit: it contains a significant amount of protein, vitamin A, vitamin B and vitamin C, potassium, calcium, magnesium, iron and fiber. If you eat one banana every day, it will certainly contribute to your health to a great extent. Bananas, like apples and watermelons, can float on water. Bananas do not grow on trees. The banana plant is actually the largest grass in the world. The banana has no stem with a regular tree, but a thick stem composed of layers (similar to onions) called a stem. The scientific name of the banana is Musa sapientum, which means "fruit of the sages." The source of the cultural banana, the edible variety, is in Southeast Asia. They started eating it already in the prehistoric period. The banana arrived in America in the 16th century, by the Spanish who came to the mainland. The only place in the US where bananas are commercially grown is Hawaii, with most bananas coming from Latin America and South America, including Costa Rica, Ecuador, Colombia, Honduras, Panama, Guatemala. The type of banana that is sold in the supermarket is called Cavendish banana. In the past there was a popular variety of Banana in America called Gross Michel, which was extinct in the 1940s, because of a mushroom that spread and attacked the crop and caused the "Panama disease". A cluster of bananas is called a hand, and one banana is called a finger. Each banana hand has about 10 to 20 fingers. About 75% of the weight of the banana is water. Japan uses bananas to make fabrics and paper. Bananas help to reduce depression. Studies have found that people who have suffered from depression and ate bananas have significantly improved their mood. This is because the banana contains tryptophan - a substance that the body turns into serotonin, which raises mood. Rubbing the inside of the skin of the banana on the skin in case of a mosquito bite (or other insect) helps to prevent the itching and the development of inflammation. If you have a wart rubbing the inside of the shell every night, it can cause the wart to disappear within a week or two, because of the potassium in the cortex. Banana is good for athletes - Banana has three types of natural sugars, which together with the nutritional fibers they provide instant energy and quality. The low-fat banana is easy to digest and has essential carbohydrates to supply energy before, during, and after exercise. The banana has a lot of iron and is therefore good against anemia. The banana is good for relieving stress and tension. 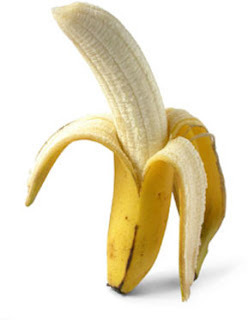 The bananas have high levels of vitamin B, which helps calm the nervous system. When we are under stress, the metabolic rate accelerates and the level of potassium in the body decreases. Potassium is a mineral that helps maintain heart rate, sends oxygen to the brain and regulates fluid levels in the body. Therefore eating banana increases the level of potassium in the body and calms the stress. Rubbing a banana peel on the teeth for about two minutes each night will whiten your teeth naturally. The results come in about two weeks. This works because of the effect of potassium, magnesium and manganese in banana peel. Bananas are also a great hair conditioner that helps to restore dry and damaged hair. Cook a banana and add a tablespoon of cream and a tablespoon of honey to the mixture. When it cools, place on dry hair, cover with a bathing cap and then wrap in a warm towel. Leave everything on the hair for an hour and then rinse thoroughly with warm water. Then overlap the head with shampoo. Rubbing a banana peel on the forehead can help cure a headache. Bananas and banana peel become excellent fertilizer for the soil because they contain phosphorus and potassium. The roses especially love them. Rubbing the inside of a banana peel on leaves of potted plants will make them shiny. You can use the banana peel to clean and polish leather shoes. With banana peel you can make excellent polish for silver. Rub the dishes with the inside and then move with a cloth and the dishes are polished and sparkling.